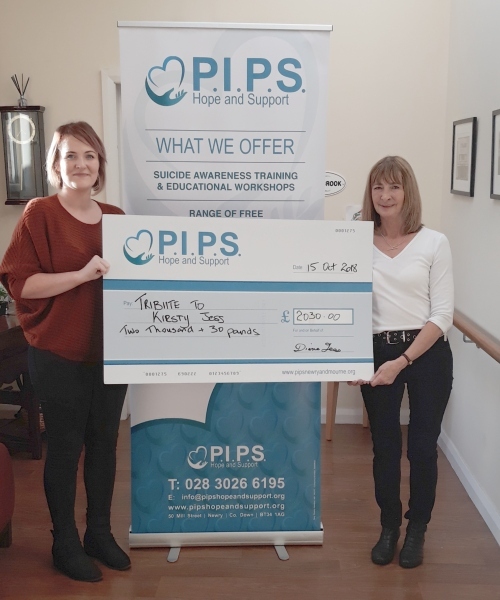 Diane Jess and Louise McConville present PIPS Hope and Support with a cheque for £2030, proceeds from their recent fundraising event," A Tribute to Kirsty Jess" which was held on Friday 7th September at Dromore Rugby Club. The event was full to capacity and comprised of a Fun Table Quiz, Bingo and Disco. Diane and Louise would like to extend a huge thank you to Dromore Rugby Club for hosting the event, Phil Ogle for his help in organising the night and providing the music and to Seamus McCabe , Chief Executive of Hope and Support, who delivered an informal but informative talk on the services PIPS Hope & Support can offer. A special thank you to everyone who attended on the evening and also to the many local businesses which sponsored or supported the event and to all our family and friends for their tremendous support. "Our aim was not only to support the good work PIPS carries out but to raise awareness in the community of the help and support they can provide." PIPS Hope and Support send their thanks and appreciation to Diane, Jess and each person who supported the event in anyway.